DALLAS (FWAA) – Mississippi State quarterback Dak Prescott was responsible for six touchdowns in a 42-16 win over Kentucky, tying a 63-year-old school record. 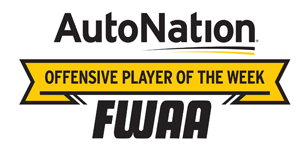 Prescott threw for 348 yards and three touchdowns, and ran for 117 yards and another three touchdowns, a 465-yard total offense mark that earned him the AutoNation National Offensive Player of the Week honor for games of the weekend of Oct. 24, as selected by the Football Writers Association of America. The 6-2, 230-pound senior from Haughton, La., surpassed the 300-yard passing mark for the fifth time in his career and for a second straight game, completing 25-of-35 passes. The six touchdowns ties Jackie Parker’s school record set in 1952. Prescott became the first Southeastern Conference player since Heisman Trophy winner Cam Newton in 2010 to account for six or more touchdowns in an SEC game. Prescott is one of two Football Bowl Subdviision players with at least 14 passing touchdowns and seven rushing scores, along with Patrick Mahomes of Texas Tech. He currently owns 36 school records (seven single-game, 15 single-season and 14 career), and last week became the 17th player in FBS history and only active FBS player with 7,000-plus career passing yards and 2,000-plus career rushing yards.